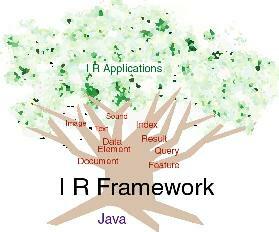 is a freely available object-oriented framework for information retrieval (IR) applications. A framework is software which defines the architecture of a group of related applications and supplies many of the basic components out of which they can be built, allowing application developers to extend the basic components to meet their special needs. IRF comes with a very simple text IR application (SampleApp) built on the framework and two small text collections HCI and Cranfield. It was developed by the Retrieval Group in the Information Access Division at the National Institute of Standards and Technology (NIST). As is, SampleApp/IRF is suitable for experimentation on very small text collections. IRF was designed with multimedia IR in mind. Acknowledgements: We gratefully acknowledge that the starting point for IRF was the proprietary FIRE system developed in C++ by researchers at what was then UBS's Information Technology Laboratory. We appreciate their support. They deserve credit for many good design decisions that survive in IRF, which started as a translation of the core elements of FIRE. They are of course not responsible for any problems we may have have introduced into IRF in the translation and modifications we carried out to remove dependencies on proprietary code and a commercial object database. Restrictions on IRF's use: Both IRF and the sample application are coded entirely in JavaTM. The BufferedRandomAccessFile class was developed outside of NIST and is covered by a GNU General Public License. All other classes were produced at the National Institute of Standards and Technology by employees of the Federal Government in the course of their official duties and, pursuant to title 17 Section 105 of the United States Code, are not subject to copyright protection. They are in the public domain and can be redistributed and/or modified freely provided that any derivative works bear some notice that they are derived from it, and any modified versions bear some notice that they have been modified. Disclaimers: IRF is an experimental system. NIST assumes no responsibility whatsoever for its use by other parties, and makes no guarantees, expressed or implied, about its quality, reliability, or any other characteristic. We would appreciate acknowledgement if the software is used. Please note that any mention of commercial products in the Guide or other IRF documentation is for information only; it does not imply recommendation or endorsement by NIST. Downloads: You can download the IRF package (java source, class files, guide, and class documentation, and sample document collections).